I will vote for Bernie Sanders (1), in the 2020 Primary Election. The reason is that not only US needs to have Medicare for everyone, but Medicare needs to be improved and not curtailed as some US Republican Party representatives in Congress suggest. Already PSA test has been removed from Medicare recommendations for annual physical exams that delays diagnosing prostate cancer on time which means higher costs and even death of the patient. My family just like many other Americans have suffered because of lack of health insurance all these years and we are all US Citizens. 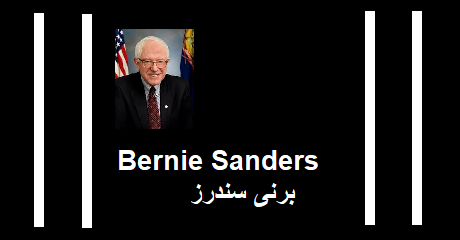 Although in the last election, I voted for Bernie Sanders, I do not like the Democratic Party's policies on Iran, and I support regime change in Iran (3), and especially I did not like the policies of President Obama towards Iran, which I noted a long time ago, before Obama Era, i.e. 15 years ago in 2004 when John Kerry was a presidential nominee from the US Democratic Party, I clearly discussed my view on this subject, in an article entitled "Mr. Kerry, Islamic Republic of Iran Must Go" (4), but for America and the world as a whole, I believe United States as a leader of free world, needs to set a good example in healthcare for our own people, and in a Iran's Secular Democratic and Futurist Republic, I expect to have a healthcare system better than the Western European nations, Canada, Australia, and Japan, and not something like the third world countries! I believe the founders of United States of America did great 243 years ago but missed this important issue to ensure the healthcare for all people living in the USA (5).